Ellen DeGeneres's winning, upbeat candor has made her show one of the most popular, resilient, and honored daytime shows on the air, and her life makes for great (and very funny) reading. Relatable, her first stand-up special in 15 years, airs on Netflix beginning December 18, 2018. "I've experienced a whole lot the last few years and I have a lot to share. So I hope that you'll take a moment to sit back, relax and enjoy the words I've put together for you in this book. I think you'll find I've left no stone unturned, no door unopened, no window unbroken, no rug unvacuumed, no ivories untickled. What I'm saying is, let us begin, shall we?" Seriously... 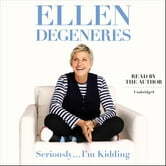 I'm Kidding is a lively, hilarious, and often sweetly poignant look at the life of the much-loved entertainer as she opens up about her personal life, her talk show, and more. Easy to follow while working out and you see the same Ellen that we love everyday. Frankly...the book was like meh!? Really didn’t see why it is so highly rated. Complete gibberish. I use to buy the book to be able to read while listening. The audiobook didn’t match with the book. Je vais continuer en français. Plus facile pour moi! J’ai beaucoup de respect et j’aime beaucoup l’auteur, mais je comprends difficilement qu’elle ait conçu un livre avec si peu de contenu. 80% de ce livre aurait dû aller à la poubelle selon moi. Manque de respect pour les lecteurs et les auditeurs et pourtant, elle remercie ceux qui ont acheté son audiobook au moins trois fois! Quand un auteur n’a rien a dire, préférable d’attendre que l’inspiration vienne par simple respect pour les lecteurs. Conclusion: grosse déception! J’attendais tellement plus d’Ellen DeGeneres. I loved this book. I love Ellen, she's funny, beautiful, honest, straightforward and im going to listen to it again! I'm a big fan of Ellen and this book is a magnificent piece.